Someone asked a question on Stackoverflow the other day about the existence of so many image libraries in Android . Its interesting to note that Fresco seems to be a new library that is doing some interesting optimizations to memory use and could be worth checking out. This is pretty difficult agreed for a fifth grader – but being an olympiad puzzle its meant to be difficult and challenging but smart kids can solve it. I wonder why adults are making a fuss out of this one ? How does Albert know Bernard does not know too? They way to think about this is that for Albert to be confident that Bernard does not know, he must have eliminated cases where Bernard would have to know. What are those cases? Those cases are essentially if Cheryl had told Albert May or June which means Cheryl had said 18 or 19 to Bernard. In which case Bernard could definitely know. (With me?). But since Albert definitely knows(suspension of the belief that everyone lies) it cant be May or June or 18th or 19th, hence these are eliminated. Again another assumption here is that all three are really math savvy. So when Albert hints Bernard doesn’t know he has also figured out the above . 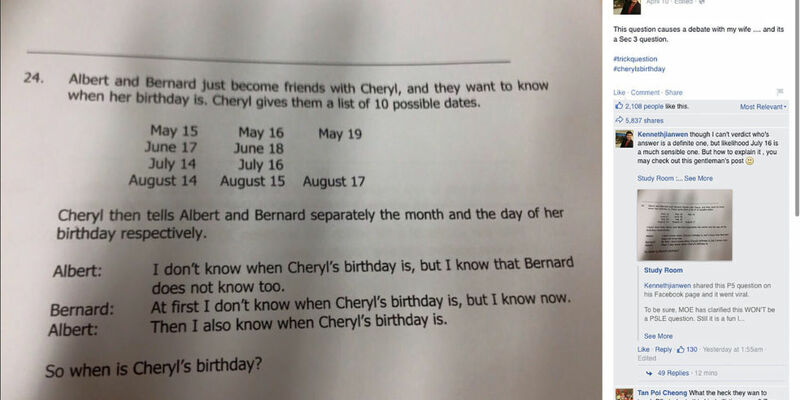 Now lets assume Cheryl had said 14 to Bernard, in which there was no way Bernard could have known when the birth month is. But since Albert’s hint about Bernard knowing the date is confirmed, Cheryl couldnt have said 14 to Bernard. Hence eliminating July and August 14th. The dates left are July 16, August 15, 17 . Now here’s the thing, Bernard has figured out the answer from this clue itself! This is the slightly tricky bit –> He knows the date i.e. 15th, 16th or 17th. Doesn’t matter which month for him really now, because they are all unique. Remember Albert knows the month. For Albert to say this he has deduced the date given the month. For Albert to know, the month has to be July, because if Cheryl had told him, “August,” then he would still have two possibilities: Aug. 15 and Aug. 17. Here’s the much tougher unsolvable variant, a similar problem called Sum and Product. I wonder if this will break the internet? Why did this particular problem go viral? There are a ton of obscure olympiad problems for lower grades? Why are adults finding it hard to solve this problem? How long did this take you to solve?